November 19th, 2007 : Cloudy and cold, Water Temp 52*. Picked clients up at 5:30 at High Point and went and caught bait. Set out a spread of 10 boards and a bobber and pulled points and flats in 10 to 20 feet of water. Got bit on every point and flat but the Stripers were a little slow in the morning. The sun popped out for about 30 minutes and we caught 4 before the clouds returned. 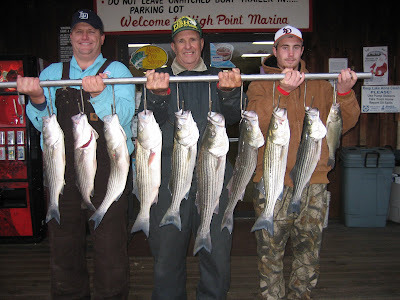 Today we had 23 hits with clients keeping 9 Stripers and a white perch to take home.